Where I find 99 per cent of my strength doesn’t come from the outside world, it comes internally. I’d say 90 per cent comes from inside, and 10 percent comes from the outside – I’d say 99.9 per cent of that 10 percent comes from a little individual called Noah, my son. Often times when it comes to requiring strength we don’t have to do things, it’s a mental game. It’s being able to create the relationship between what it is that you need to do, and what it is required from you, in order to do that. It comes down to is the self talk in our head. If you’re looking to the outside world for strength then your world will be fundamentally governed by whether the thing, or the situation is present, in order for you to be strong. This means you are completely powerless. An empowered person, an empowered perspective is where the power originates and is generated from within, it comes from a psychology, it comes from a perspective. It comes from a relationship with self whereby you understand in an empowered person, the power lies within. In most cases where we require strength, we perhaps, feel disempowered. What is the talk track that is going on upstairs? What are the suggestions that I’m giving to myself right now? What is the relationship between what this is and what this means? What is my reaction and my response to it? The way that we become empowered is by becoming conscious and by becoming aware of the relationship between self and stimulus, and the thing that we want and then becoming aware of the dialogue that’s going on inside. The dialogue that’s going on inside your head is, suggestion. It’s self suggestion, it’s autosuggestion, it’s self hypnosis. Whatever we say to ourselves on a repeated basis internally becomes expressed externally in some form of a physical behaviour. 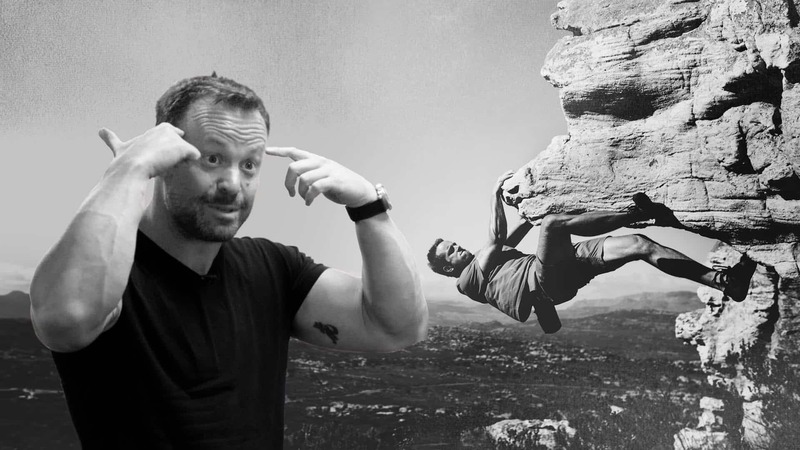 If you’re not behaving physically, in the way that you want in situations that require strength, then it would be fair to say there was a level of conditioned psychology and thought required, to suggest over, and over, and over, and over, and over, and over infinity times plus one, to get to the point where the psychology builds strength. ‘A strong mind builds a strong body,’ doesn’t necessarily just happen. It happens as a result of a level of discipline and structure and order that’s happening upstairs where thought is currency. My advice here is, find the strength from within, stop looking for strength from without. Although I get strength from my son, we’re talking a 10 percent factor. There are situations when I’m training and I’m doing a max rep set, and I’m feeling like, OMG, I don’t know if I’ve got the kit to do this. If Noah was here right now, what example would I want to set for him? When that happens, boom! I click into f***ing overdrive and I smash out what I need to do. But that’s my 10 percent. If it was the other way around and I needed to tap into his presence 90 percent of the time, and I only had my own internal 10 percent, I would be governed by my ability to be around him or to think about him. Choose your own thoughts, become conscious, deliberately hand select and choose the thoughts that you want.